One of the top supported team in south America as well as all over the world and also one of the most successful team in Copa America by winning 2nd highest 14th title of it, team Argentina is considered the top favourite in this centennial event of Copa America 2016. Team Argentina is placed in group D where the rest group mates are Chile, Panama and Bolivia. They are scheduled to play their 1st match in this season of CA against the defending champion Chile in next 6th June, 2016 at Levi’s Stadium, United States. Team Argentina and Chile were both in final in last Copa America 2015 where Chile defeated Argentina by penalty shoot out. So, here is chance for Argentina to destroy Chile as a revenge of that match. Chile and Argentina has played their last match in 25th March, 2016 where Argentina defeated them by 2 – 1 goals which was the World Cup Qualifying match. So, their upcoming match will be challenging expected by worldwide football lovers. Let’s see the current team squad of Argentina and Chile which is listed below. Yes of course, Argentina have some most talented players like Lionel Messi, Sergio Aguero, Carlos Tevez, Gonzalo Higuain, Ezequiel Lavezzi, Angel Di Maria and so on. They are all-star player. They play in different renowned clubs like Barcelona, Napoli, Manchester City and so on. They are all in form now. 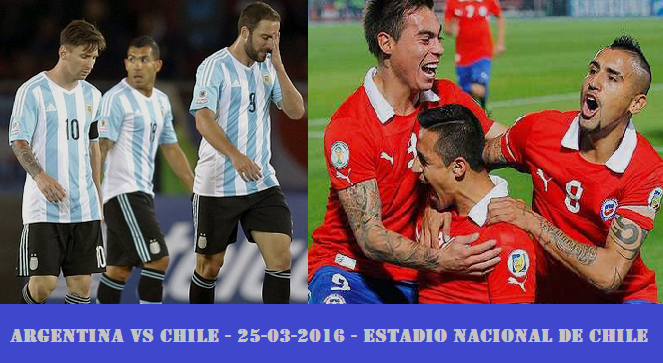 It is so difficult even for Chile to stop them all in field. Besides, team Argentina has world-class goalkeeper Sergio Romero. They all should be in best eleven. Let’s take a look the possibly best eleven listed below. Chile also have some star players of this time being named Arturo Vidal, Alexis Sanchez, Eduardo Vargas and so on. Specially Arturo Vidal and Alexis Sanchez are two famous footballer nowadays.In the season of 2014-15 & 2015-16 in club, Sanchez has totally played 50 apps and got 22 goals. And for Chile national team, in the year of 2015, he has totally played 14 apps and got 5 goals. He is a fearsome footballer.So,let’s take a look below the possibly best eleven. According to the statistics, team Argentina played against Chile totally 87 times where Argentina won 58 times and lost only seven times. 22 matches were drawn by them. So, no doubt, Argentina is the favourite among them and possible chance to win again.